Authors: Knab, J. R.; Lu, X.; Vallejo, F. A.; Kumar, G.; Murphy, T. E.; Hayden, L. M.
Abstract: We have investigated the broadband terahertz (THz) optical properties of nanoporous silicon samples with different porosities and the ultrafast carrier dynamics of photogenerated charge carriers in these materials. Following photoexcitation, we observe a fast carrier recovery time consisting of two dominant recombination processes with decay constants below ~10 ps. All samples exhibit initially low THz absorption that increases at higher frequencies, and is likely due to contributions from phonon bands and oxidation of the porous surface. The refractive index depends on porosity but shows little frequency dependence. 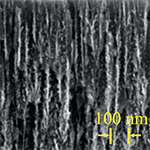 These properties indicate that nanoporous silicon is a useful material for fast, ultrabroadband THz applications (e.g. intensity modulation).